Mr. Eugenides has a must-read post exposing just how completely the Independent has turned around on the biofuel issue. 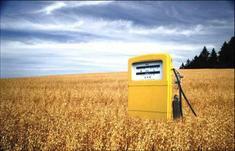 In 2005 they were fervent supporters of biofuels and the new transport fuel obligation. Now, without the slightest embarassment, they are running a front-page on the mounting criticism of the new obligation from within the green movement and the human cost of buying up large amounts of agricultural output to replace petrol. Massive subsidies for biofuels across the developed world are creating more and more human and ecological crises - and are pushing up food prices. This disaster is a testament to the dangers of listening uncritically to a green movement that too often fails to think seriously about the effects of its proposed measures. The Renewables Obligation is another example of a green policy that has seriously unpleasant side effects and fails to achieve its objectives as I set out in this blog for the TaxPayers' Alliance. "There is no question for now of suspending the target fixed for biofuels," said Barbara Helfferich, spokeswoman for EU Environment Commissioner Stavros Dimas. "You can't change a political objective without risking a debate on all the other objectives,"
While I'm on the subject of environmentalists misunderstanding agricultural economics, Peter Franklin is completely wrong on food security which is largely a non-issue for Britain. We produce a pretty large share of our own food at the moment compared to the norm since the abolition of the Corn Laws. In the First and Second World Wars, for all the "Dig for Britain" rhetoric we had little difficulty feeding our population - in fact, diet is thought to have improved. Unless Peter really thinks there is going to be a greater challenge to our food supply than the U-Boats and economic demands of WW2 then there's little reason to worry about it. Britain can feed itself easily enough if it really needs to.